AUSTRALIA’S PRIME MINISTER Tony Abbott has vowed to change after surviving a confidence vote on his leadership. Abbott has been fighting for his job after poor poll ratings and a series of policy backflips spurred some MPs from his conservative Liberal Party to openly attack him, calling last week for a leadership “spill”. The motion aimed to declare vacant the positions of party leader and deputy leader, occupied by Abbott and Foreign Minister Julie Bishop. If it had succeeded, the party room — Liberal Party members of both houses of parliament — could have voted for new candidates. But the 101 Liberal parliamentarians — one was absent — rejected the proposal by 61 to 39 in a secret ballot. One vote was discarded for either being incorrectly completed or not filled in at all. 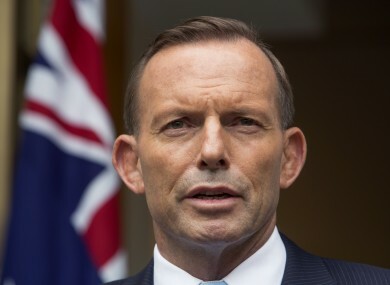 In a brief televised statement, Abbott called for the party to end “disunity and uncertainty” and move forward. We are absolutely determined to work for you, the people who elected us. We want to end the disunity and the uncertainty which destroyed two Labor governments and give you the good government that you deserve. Labor switched leaders twice during its time in power from 2007 to 2013, with Abbott highly critical at the time. Abbott said that “when you elect a government, when you elect a prime minister, you deserve to keep that government and that prime minister until you have a chance to change your mind”. He admitted in a later press conference that the government had “bitten off more than we could chew” in trying to rein in a growing budget deficit by slashing health and education spending while tightening welfare, moves condemned as too harsh. “I have listened, I have learnt, and I have changed and the government will change with me,” he said, vowing to be more “consultative and collegial”. Abbott, 57, survived despite waking to a dire Newspoll in The Australian broadsheet, and the vote outcome is unlikely to end speculation about his future. The poll showed the ruling Liberal-National coalition trails the Labor opposition on a two-party basis 43 percent to 57 percent, while 68 percent of the 1,178 people interviewed were dissatisfied with Abbott’s performance. His popularity lags far behind Communications Minister Malcolm Turnbull and Bishop, both touted as potential leadership contenders, but who have not formally put their hand up as an alternative prime minister. Opposition Labor leader Bill Shorten said the government was “in paralysis”. The prime minister and ministers should be protecting the living standards and jobs of all Australians — but they’re only interested in their own jobs. Since being elected in September 2013, the government has sealed free trade deals with China, South Korea and Japan. It also killed off controversial carbon and mining taxes and sharply reduced the number of asylum-seeker boats arriving in Australia. But the proposed savings to curb the budget deficit alienated many voters, with Hockey widely criticised for failing to sell them sufficiently. Abbott has also been criticised for changing positions on several issues and his high-handed decision making, with the bid to unseat him coming after he awarded Britain’s Prince Philip a knighthood last month. Email “Australia's PM: 'We've bitten off more than we could chew'”. Feedback on “Australia's PM: 'We've bitten off more than we could chew'”.